The entry into the Car-PC world can be very hard. In the last years there was an real flood of new products. On the one hand this enables highly individual systems, but on the other hand makes it difficult to get the full picture. This guide shall help you to go the first steps into the car-pc subject area. In this guide we will deal with basics but also go indepth on important topics. You will find a lot of single parts in our shop which enable you to build an individual Car-PC. 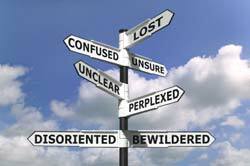 Here pretty often so-called "Barebones" are causing confusion. Those are usually system bundles with components, which do not follow an "official" form factor. A splitting up into single offers makes here then no sense, since these individual parts cannot be used with other parts. Example: CALU-Series. These barebones already contain enclosure, mainboard and power supply. If you add CPU, RAM, HDD, then you have a fully complete system. We follow the approach that your completely individual requirements are the center of attention. If you know, what your system should be able to do, then we can tell you which hardware you need ! A genuine assistance is here also our automatic configuration assistance "Bob" (see animation on the right side on the Systembuilder start page). But please do not hestiate to contact us with your desires ! Example: M4-Box. Enough room for a 5.25" CD/DVD drive, a PCI-card and the M4-ATX Advanced power supply. His 250W power enables to realize extended Core-systems. Example: HAHE-MC. The right enclosure for the Half-Height Mini-ITX Intel D945GSEJT mainboard is straight once 20 x 18 x 4 cm in size ! First fundamental. In vehicles the car battery is available as energy source. This supplies in cars "nominal" 12V DC (truck 24V DC). The reality looks however differently. If the engine is off, then batteries actually usually supply their nominal value (reduced with the battery age however). If the engine is started, the power is supplied however by the light generator, which supplies 13.8V (truck ~27V). By voltage peaks the value can also rise for a short time to 18V (truck 30V). At the lower end we have the engine start (ignition time). Here the current supply sags for a short instant on ~9V together. The power supply for the CarPC must be thus able to cover the range from 9-18V (truck ~19-30V) ! And here we already come to the next problem definition: How do you want to start the PC? With your Office PC you are used to use the power button on the PC enclosure. But in the vehicle you are used to components like e.g. the radio that can automatically switch on and off. That is also possible with a Car-PC ! 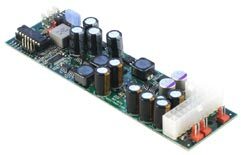 In our assortment you will find for example the power supplies M1-ATX, M2-ATX (- HV), M3-ATX and M4-ATX. These differentiate itself particularly in the shape, in the power rating and in the function range. Which they have in common is the function of automatic starting up and shutting down the PC depending on ignition state (=Ignition plus/Switching plus/ACC line. Thats the power line which tells your radio to turn on or off). The power supply is connected thereby on the one hand with the ignition plus wire of the vehicle and on the other hand with the "PW-SW" (=Power-Jumper) of the mainboard. With office PCs this Jumper is connected with the power button of the housing. With CarPCs the power supply takes over the job of switching on and off! Example: M2-ATX. The quasi-standard offers 160W, ignition based Start and shutdown with configureable time delay and deep discharge protection for the battery. Example: M3-ATX. Like M2-ATX, but smaller. The direct placement on the mainboard again enables even smaller systems. 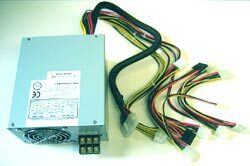 Example: 500W DC ATX power supply. Who wants it completely rabiat, can empower i7/Nvidia systems with this power supply. Example: CarTFT DC/DC converter. Because connecting a PC to ignition plus line implies a fixed installation, the initially mentioned DC/DC converters with connection to the Cigarette lighter plug have its existence authorization: Users, who frequently change vehicle, will appreciate this possibility. If you already threw a view on our rich display assortment, then you are surely helpless to find a suitable model. But similarly as with the other components (e.g. 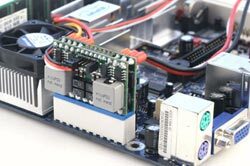 mainboards) also here each individual model has its individual characteristics and functions, which are necessary for the respective task. First of all the displays differ particularly in size. The selection is thereby from 7" to at present 12". In the passenger car usually come 7" and 8" display to employment, in VANs 8" to 8.4" and in trucks also up to 12". By the display sizes with models with Aspect ratio 16:9 (or 15:10) it comes to a technical phenomenon: The native resolution can correspond here to a non standard VGA resolution, because these always follow the 4:3 aspect ratio (e.g. 800x600 or 1024x768). The native resolution with with 7.0" , 8.0" and 10.2" TFT displays however is 800x480. They can nevertheless e.g. display 800x600 on these devices, but the picture will be shown slightly pulled. Most customers do not disturb themselves to it however. But a solution is the use of models with so-called "True-800x480-Support". For these models we offer graphic drivers and settings which enable to output 800x480 with the PC. The models continue to differ in form factor. There are the so-called "On-Dash" modelss, those are fastened at or on the car dash or at the window. "In-Dash" models find place in the single or double DIN radio slot. "Roof-mounted" displays become attached at the vehicle roof. "Open Frame" models are suitable for complex individual integrations. Important is also the screen brightness. In the Office-section displays come with a brightness of 150-250 nits (nits = the unit for measurement the density of light of background. Often also indicated in cd/m ²). In the vehicle-section this is too little ! In buildings you are well "shielded" of the daylight and art light is in most cases used. In the external area the light intensity is much stronger. Around this to compensate the display must have a higher brightness. CarTFT.com judges 400 nits to be standard. A higher value does not harm however. In the case of use under more direct Sun effect (e.g. cabriolets) it is almost must! For this we offer an range of so-called "Premium" - displays which allow perfect viewing also under direct direct sun exposure (by help of so called "transflective" techniques). Together however all models have that they have a VGA input. A basic condition for the use with PCs. Example: CTF700. 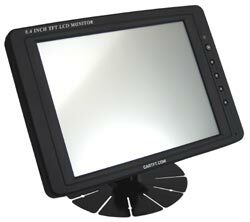 A standard 7" TFT display with touchscreen, speakers and rear camera input. Example: CTF845-SH. Premium transflective 8.4" touchscreen display for maximum readability also during direct sun exposure. Example: CTF400-M. Open-Frame 7" variant of the CTF400-model. With your Office PC you are used to control it with keyboard and mouse. Now it would be somewhat difficult to place/mount these devices in a car , but separates a use nevertheless for practical reasons actually. The solution is called "Touchscreen". 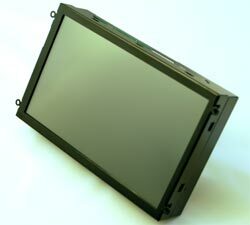 Most our TFT display models are equipped with Touchscreen. The Touchscreen replaces the mouse. Actually even the right mouse button can be simulated. Text inputs take place by means of the so-called "On-screen-keyboard" with that the letters/indications on the screen to be indicated. Whom this is not sufficient, further possibilities are to that at the disposal. Example: CTFWIKE-2. Wireless keyboard with integrated Mouse-function. Example: Powermate. Turn freely configurable button to, press and pressed turn. 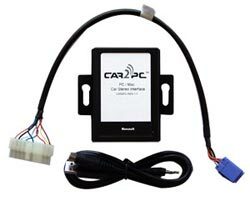 Example: Car2PC Adapter. These adapters make on the one hand the control possible over the operating knobs of the radio/steering wheel remote and on the other hand provide an AUX input for bringing the PC sound into the car sound system. Usually Windows is used with CarPCs as operating system. The reason lies also here as with Office PCs that most software is available for this OS. When it comes to navigation the programs Fleet Navigator from Map&Guide and Centrafuse NAV edition from Fluxmedia offer modern functions such as speech output and TMC function. For comfortable control there are so-called "Frontends" available which bundle all functions and programs on one simply by Touchscreen controlable surface. Example: Fleet Navigator. 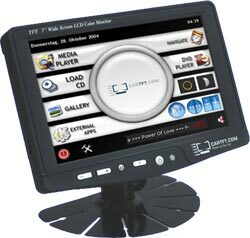 Modern navigation software with Speech output, On-Screen keyboard and TMC-support. Example: Centrafuse. Comfortable Car-PC Touchscreen surface for Windows. We hope that we could help you with this guide to a view of the Car PC world. 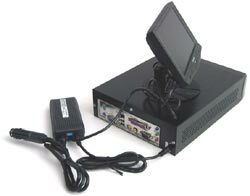 Whom the use of miniature PCs in the car is not sufficient, our daughter shop www.minipc.de is recommended to that. 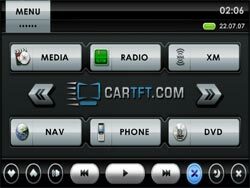 There you find a selection of the assortment of CarTFT.com, but prepares thematic for the use as Office or HTPC. (c) CarTFT.com, Author : Oliver Aigner.